The introduction in Europe in 1996 of the Community trade mark (CTM) brought into being a new and independent trade mark system with its own sources of law, its own procedures, and its own administrative and judicial bodies, notably the Office for Harmonization in the Internal Market (Trade Marks and Designs) (OHIM), the agency designated to process applications for the registration of CTMs. In 2011, OHIM for the first time received 100,000 applications in one and the same year – which was also the year in which the one millionth application was filed. Case law of the European Court of Justice (ECJ) and the European General Court (EGC) on the interpretation of the Trade Mark Regulation and the Trade Mark Directive is – together with decisions of OHIM and its Boards of Appeals – absolutely central to the understanding of Community trade mark law, including the trade mark laws of Member States. This book offers an in-depth scrutiny, categorization, and analysis of this extensive body of case law. Also covered are the pending and proposed amendments to the Trade Mark Regulation and the Trade Mark Directive. This book covers in depth the practical applications of this important and much-used body of law. 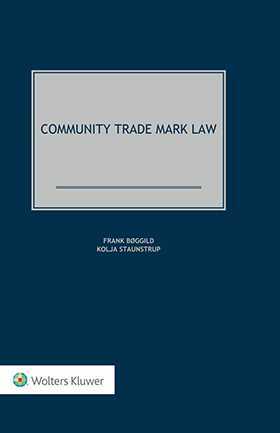 It will be of enormous value and benefit to company lawyers, attorneys, trade mark attorneys, and anyone else dealing with trade mark law, whether on a Community level or nationally. CHAPTER 2 The Importance and Functions of Trade Marks. CHAPTER 3 OHIM and the Appeals System. CHAPTER 4 Trade Mark Strategy. CHAPTER 5 Absolute Grounds for Refusal. CHAPTER 6 Relative Grounds for Refusal and Trade Mark Infringements. CHAPTER 7 Limitations of Exclusivity. CHAPTER 9 Grounds for Revocation and Invalidity. CHAPTER 10 Priority, Seniority, Alteration, Renewal, Restitutio in Integrum, and Conversion. CHAPTER 11 Collective Marks, Certification Marks, and Guarantee Marks. CHAPTER 13 National Trade Mark Courts, Injunctions, Provisional Measures, and Sanctions.